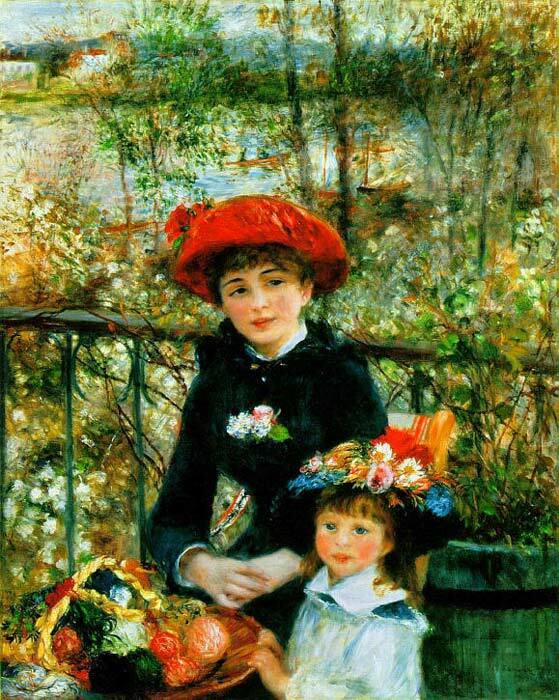 Pierre Auguste Renoir concluded his fifteen-year exploration of the theme of bourgeois leisure with this superb painting of 1881. The setting is a terrace of the Restaurant Fournaise, an establishment in the village of Chatou, on the Seine, where Renoir had previously executed The Rowers' Lunch, among other works. A celebration of the beauty of spring and the promise of youth, Two Sisters On the Terrace is a technical and compositional tour de force, a virtuoso display of vibrant color and variegated brushwork. The almost life-sized figures (who were not sisters, as indicated by the work's original title, but unrelated models) occupy a shallow space in front of a terrace railing; behind them quivers a lively, leafy landscape that brings their sharply delineated forms into vivid focus. The two girls' faces are extraordinarily refined—revealing Renoir's new emphasis on draftsmanship—and their porcelain complexions are uncompromised by reflections or shadows. The young child's irises are an almost startlingly clear, translucent blue, suggestive of the artist's desire to help us see the world afresh, through innocent eyes. SPECIAL NOTE : The painter will make the reproduction as close to the original oil painting as possible. If you want your painting to alter from this likeness, please email us and " Two Sisters on the Terrace, 1881 " will be reproduced according to your special requirements.